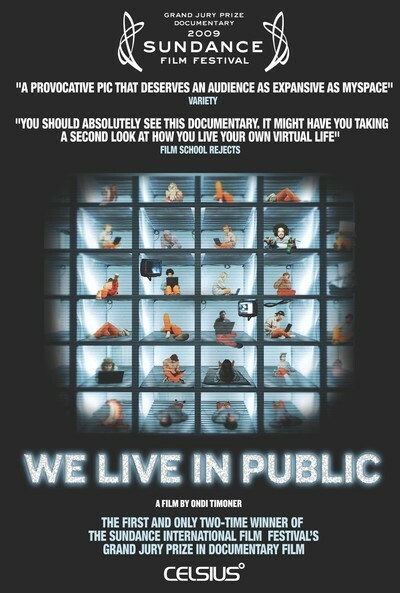 I'd never heard of Josh Harris, who is billed in "We Live in Public" as "the greatest Internet pioneer you've never heard of." I can be excused for thinking Harris was the fictional hero of a pseudo-documentary, until the film quickly and obviously became authentic. It's not often you see a doc that's been filmed over a period of 15 years. Harris was involved in the early days of Prodigy, back in the CompuServe era, and in 1993 founded Pseudo.com, which forecast audio and video Webcasting, YouTube, Hulu and countless other streamers. He was, to put it kindly, ahead of his time. In 1993, 300-baud modems were commonplace, and 1200 was fast. Harris was a myopic visionary, a man who saw the future more vividly than his own life. He was a prototype nerd, a lonely kid who raised himself while planted in front of an old black-and-white TV set, using "Gilligan's Island" as a virtual family to supplement his own remote mother. In the 1990s, he became one of the early dot.com millionaires, a celebrity in New York, where he threw lavish parties intended not so much for the famous as to attract brilliant and artistic kids to work for him. Pseudo.com is remembered from that time as Nerd Heaven, with good pay, perks, free creature comforts -- demanding only your body and soul. He sold Pseudo for something like $80 million, and that was the end of his good timing. The filmmaker Ondi Timoner had already started to document Harris' life, and was on the scene when he began a notorious project named Quiet. Try to imagine this: About 100 of the best and brightest he could find agreed to live 24 hours a day in a cavernous space below street level. They would be under video surveillance every moment. Their lives would be streamed on the Web. They shared dining and recreational facilities and even a shooting range. They were given state-of-the-art computers. They lived in cubicles with the square footage of perhaps six coffins. These were stacked atop each other like sleeping pods in a Japanese airport. And this was to be the future, in which we would all live virtually on the Internet. The recent film "Surrogates" perhaps owes something to Harris. Remarkably, no murders claimed any of Quiet's eager volunteers; whether any births resulted is not reported. The fire department closed him down in the first days of 2000, but Harris, not missing a beat, moved with his girlfriend into an apartment where every single room was Webcast 24 hours a day -- every meal, every bowel movement, every sexual event, everything, including their (inevitable) ugly breakup. "She was only a pseudo girlfriend," he explained later. But did she know that?